Tackle inequality by transforming the tax system - The FM Report There is no easy solution to the problem of rising economic inequality, but we may be able to address it with a more enlightened tax system – one that maintains incentives for work and investment while improving economic efficiency. There is no easy solution to the problem of rising economic inequality, but we may be able to address it with a more enlightened tax system – one that maintains incentives for work and investment while improving economic efficiency. Rising economic inequality is a pressing problem that drags down growth and destabilises societies, putting low- to middle-income earners in increasingly precarious economic situations as fewer people control a growing share of income and wealth. While the biggest impact is on those on the lower end of the economic spectrum, economic inequality has ramifications for everyone. Government revenue streams are growing more stretched as tax coffers shrink and welfare expenses rise; this can reduce the level and quality of government services across the board. And as the divide between the haves and have-nots expands, resurgent populism is threatening to create headwinds for economies and markets. Given these tensions, couldn’t we construct an economic model that maintains the benefits of capitalist production while limiting its tendency to create extreme inequality? One answer could be through a more enlightened tax system that incentivises investment while sharing the benefits of economic efficiency. Here are six ideas to help us get there. Governments have long searched for ways to encourage lower-income workers to work and reduce their dependency on state support. Universal income is a popular proposal among academics, but a negative income tax for low-income employees may be a better solution. Similar to how the US earned-income credit functions, a negative income tax would “pay” workers whose incomes are under a certain level. It could effectively target subsidies at people who don’t earn much but are economically active, and it could limit the negative incentives created by welfare systems that provide basic support in exchange for not working. For this idea to be effective and sustainable, however, careful thought must be given to the transition between negative tax rates and positive ones. Automation and artificial intelligence have already displaced or eliminated millions of jobs around the world, and tax codes can make matters worse by taxing corporate earnings from automated processes at a lower rate than earnings from employing humans. This could be addressed by levelling out tax rates on employment income with tax rates on investment income and gains. Moreover, adjusting capital gains for inflation so only real gains are taxed would provide a greater incentive to invest for the longer term. These ideas might reduce efforts to reclassify employment income as investment income – a technique that many hedge funds use to lower tax bills for their employees, but that also reduces revenue streams for governments. In many countries, social security (or payroll) taxes are taken out of earnings only up to a certain level. 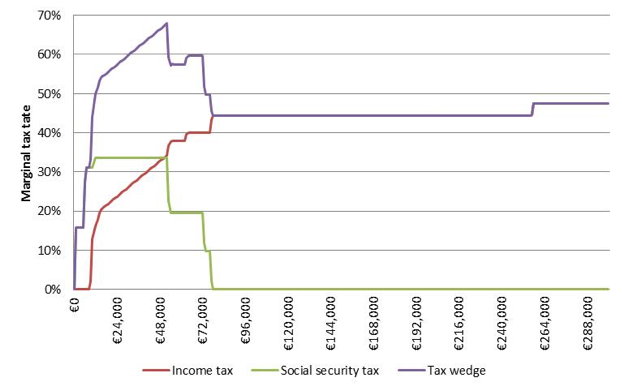 This can create unfair “tax wedges” – an example of which can be seen on the accompanying chart, which shows a higher sum of income and social security taxes for low- and middle-income earners than for higher-income earners. By making tax wedges more progressive – or at least not regressive – governments could reduce incentives for individuals to either not work, or to limit how much they work. These marginal tax wedges are higher for low- and medium-income earners than they are for high-wage earners, and they peak at about the average wage. High levels of debt are a drag on economic growth. Yet in much of the developed world, corporate remuneration is linked to earnings per share, which can make it more profitable to use increased leverage to buy back shares. Tax codes also make it more attractive for companies to secure financing by taking on debt rather than using equity. A more fair system would tax corporations on their operating earnings – earnings before interest and taxes. One goal of tax reform should be to tax wealth rather than income in way that is both fair and hard to circumnavigate. Land taxes could be one such solution. A 1% annual tax on the market value of land – but perhaps not on improvements that enhance the value of the land – could make it more rewarding to develop land to its optimal economic use before selling it, and make it more expensive for speculators to hold on to undeveloped land while speculating on increasing prices. A tax like this could secure much-needed revenue that helps close the inequality gap while encouraging economic growth. Implementing a land tax is one way to reduce the amount of income that some wealthy citizens shield from taxes while also ensuring they still contribute their fair share to good government. Many similar loopholes exist, created by lobbyists and exploited by accountants to lower the tax bills of high earners. Real tax reform would close as many loopholes as possible and re-invest the proceeds in lower overall taxation rates. These six steps won’t be easy to implement, and they may not solve the economic inequality problem. Yet they could help make economies more robust, more equitable and more politically stable – and even help those paying higher taxes by potentially increasing economic growth rates. Author: Karl Happe, CIO Insurance Related Strategies, Allianz Global Investors. To find out more about Allianz Global Investors talk to your financial adviser. Disclaimer: Investing involves risk. The value of an investment and the income from it will fluctuate and investors may not get back the principal invested. Bond prices will normally decline as interest rates rise. The impact may be greater with longer-duration bonds. Past performance is not indicative of future performance. This is a marketing communication. It is for informational purposes only. This document does not constitute investment advice or a recommendation to buy, sell or hold any security and shall not be deemed an offer to sell or a solicitation of an offer to buy any security.